CHAPEL HILL, N.C. — Medicaid expansion has been a hot political issue in state capitols across the country since 2009 when the Affordable Care Act was signed into law. Oklahoma and North Carolina, two states I’ve called home, have failed to expand the public health insurance program to cover additional low-income residents under the ACA. Both states have poor health outcomes and substantial low-income populations that would undoubtedly benefit from increased access to health care. And, in the past two years, both states have had gubernatorial candidates place Medicaid expansion at the center of their campaign platforms. In 2014, former Rep. Joe Dorman, a Democrat, ran to unseat incumbent Gov. Mary Fallin on the promise that he would try to expand Medicaid in Oklahoma if elected. 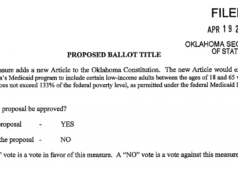 Unfortunately for Dorman, Medicaid expansion was not popular enough with voters to sway most Oklahomans to vote against the Republican incumbent, and Fallin easily cruised to reelection. Two years later, my newly adopted state saw the governor’s race as an opportunity to finally expand Medicaid. Along with repealing the infamous House Bill 2, also known as the “bathroom bill,” expanding Medicaid to cover an additional 500,000 low-income North Carolinians was at the top of Democratic candidate Roy Cooper’s list of campaign promises to fulfill if he became the state’s new governor. After a bruising campaign that lasted well into December, Cooper is finally in a position to fulfill this central promise. But can he? In early January, Cooper revealed his plan to expand Medicaid, but Republicans in the North Carolina General Assembly are devoted to blocking the effort. The GOP maintained a supermajority in both chambers of the North Carolina General Assembly, and both President Pro Tempore Phil Berger (R-Rockingham) and House Speaker Tim Moore (R-Cleveland) are united in their efforts to block expansion of the public health insurance program. Since winning a majority in both chambers in 2010, North Carolina Republicans, like legislative leaders in other GOP-controlled states like Oklahoma, have resisted expanding Medicaid at every turn. In 2013, state lawmakers passed additional legislation that would require legislative leaders to approve any plan to expand the program. In September 2015, the NCGA passed and then-Gov. Pat McCrory signed a law aimed at privatizing North Carolina’s Medicaid program by 2019. This law will move Medicaid from a fee-for-service model to a managed-care model run by three separate for-profit companies. Because the federal government foots two-thirds of the Medicaid tab, the state is required to receive approval from the Centers for Medicare and Medicaid Services (CMS) before these changes can be made. North Carolina submitted the 1115 waiver in June 2016, and the approval process is expected to take about a year. Cooper’s proposal, which seeks to amend the state’s pending CMS waiver, would require the state of North Carolina to pay 5 percent of the cost in 2018 and 2019. Cooper has asked hospitals to “step up” and contribute the funds necessary to fulfill the obligation. It’s worth noting that the North Carolina Hospital Association supports Medicaid expansion, as does Blue Cross Blue Shield of North Carolina, the largest insurance company in North Carolina. Unsurprisingly, Cooper’s actions were quickly met with a lawsuit. Legislative leaders filed suit against the federal and state Department of Health and Human Services to stop Cooper from moving forward with his plan on the grounds that his request illegally circumvents legislative authority. Meanwhile, Cooper argues that the state’s 2013 law blocking expansion without legislative approval interferes with “core executive functions” of his office. Given that North Carolina has wasted so much time, money and energy on efforts to prevent Medicaid expansion in the state, one might be tempted to think the idea is unpopular with residents, but that isn’t necessarily the case. Polling over time has consistently shown a majority of residents support efforts to expand Medicaid. In October 2014, then-U.S. Senate candidate Thom Tillis, who was locked in a tight election battle with former Sen. Kay Hagan, announced that he backed efforts to expand Medicaid in the state. Tillis’ announcement was at complete odds with his record as a state representative when he voted against expansion, but Tillis and his team evidently took the poll numbers seriously enough to change course on the topic. Even Rick Brajer, McCrory’s health secretary, admitted that Medicaid expansion had popular support from residents. During the 2016 legislative session, he told the House Health Committee that he and other health officials had heard North Carolinians voice “strong support” at forums held across the state. Regardless, Brajer said expansion would not be on the table. Now, their argument has shifted: Leaders say it would be pointless to do anything in 2017 because Republicans control Congress and the executive branch and may repeal the expansion funding. In their joint statement, Berger and Moore said Cooper’s “brazen decision” to seek expansion ignored the General Assembly’s constitutional role in the process. Excuse me? The General Assembly has rewritten the book on how to make brazen decisions, and the cognitive dissonance here is overwhelming. These are the same people who undermined local government control to pass the “bathroom bill” and called a surprise special session for the express purpose of stripping the incoming Democratic governor of executive power. Stop your pearl clutching. Regardless of the ACA’s future, suing to block Cooper’s request does nothing to help North Carolinians who need access to health care. Hospitals currently spend more than $1 billion on providing care each year to uninsured North Carolinians. Time and again, residents have voiced support for Medicaid expansion, and it’s incumbent on our elected officials to work together. Evidently, this may be asking for too much. Kelsey Kemp is a NonDoc commentator. She received her B.A. and M.PA. from the University of Oklahoma. She currently resides in central North Carolina.